Social data and real-time bidding capabilities are moving beyond cookies, enabling marketers to target ‘digital personas’ across multiple devices and channels, new research published by advertising platform RadiumOne has found. As real-time marketing becomes more sophisticated, the research has also found there is a one hour “sweet spot” to maximize conversions, by serving ad impressions in the 60 minutes after a consumer signals intent to buy. Patrick Darcy, commercial director of RadiumOne APAC said the new cross-channel white paper provides marketers with new insights on how to effectively interact with consumers across multiple devices (desktop, smartphone, tablet). “The industry is fast moving beyond cookies as the most effective way to target users. Rather than engaging with and acquiring consumer intelligence in silos, Data Management Platforms (DMPs) are unifying desktop cookie data with; mobile browse data, app data, CRM info and social data, to create anonymous ‘digital personas’. “Digital personas mean we’ve finally solved the cross-channel conundrum and can now recognise and serve relevant ads to the same person intelligently across all screens,” said Darcy. The research also found that if you serve targeted ads to the same person from screen to screen, within the hour after they’ve signaled their ‘intent’ to buy, conversion rates can be up to seven times higher than the following hour. “Social data and real time media buying capabilities are ramping up and we are now at the point where we can serve targeted ads to the same person from screen to screen, within the hour after they’ve signaled their intent to buy,” said Darcy. Ads served by travel advertisers in the ‘sweet spot’ are seeing the highest conversion rates (up to seven times higher than the following hour) and the financial services sector has also seen 2.5 times higher conversion rates within the same hour. 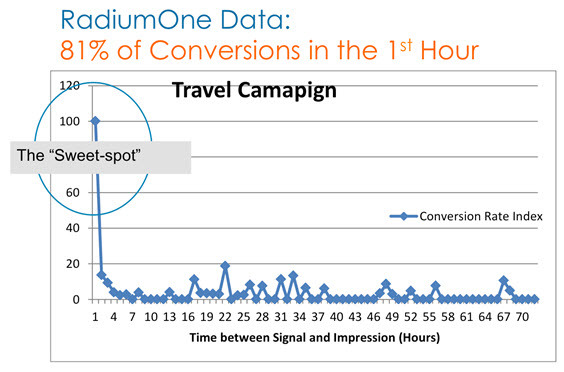 The white paper highlights how RadiumOne helps marketers reach new audiences with its integrated DMP/DSP, proprietary data, and patented ShareGraph technology. The full publication includes a series of recommendations to marketers about what they can do to tackle the cross-channel digital conundrum. By using data to intelligently connect with audiences at the right moment of opportunity, it also looks at ways to minimise the disconnection that happens when users are engaging with brands from across multiple digital touch points.